Hello and welcome to Pre-K A! My name is Mrs. Susan Meyers, or Miss Sue. Together with Mrs. Doris Nieves, or Miss Doris, we are very excited to have your children this year. 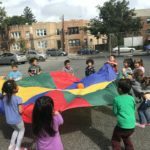 Pre-K is an exciting time for your children to learn important social and emotional skills while making new friends and exploring the world around them! We are both so happy to help them along their journey. We look forward to working closely with you to make this a wonderful experience for both you and your child! You can reach us throughout the day by using the Class Dojo app. How appropriate that Pre-K is learning about plants just as spring arrives and new life is blooming all around them! We have been observing seeds as they begin to germinate and then planted them so we can watch them grow. The students know the parts of a plant and what their purposes are. We walked to a local florist where we saw so many different kinds of plants and flowers. We are also talking about the how so many of the foods we eat come from plants and how insects are important for pollination. When we go outside, the students are so excited to see the things we are learning about happening all around them! 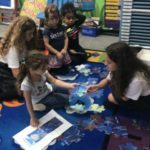 During the month of March, Pre-K explores water. The Hall of Science is visiting to do some Bubble activities. We will learn about bodies of water on our Earth and about liquid, solids, and gases and how this relates to the water cycle. Ask your child to sing you the Water Cycle song! They will discover which materials are best for absorption and do sink and float activities. Our dramatic play area has been turned into a beach and students can even build sand castles in school. They will be learning so many new vocabulary words and becoming real scientists! This month, Pre-K kicks off the light unit with a visit from the Hall of Science. They will explore various materials to see which ones are translucent and opaque. They will also make a sun dial and discover how shadows move their position based on the position of the sun. Much of center time will be done with the lights off this month as students use shadow puppets to tell stories in the reading corner, shine lights on their blocks to create shadows, make nighttime pictures and sun catchers in art, and pretend to go camping in dramatic play. We also have prisms and a light board in science center for them to explore colors. We hope they have fun as they discover new sources of light and learn the benefits of both light and darkness in our world! This month, pre-k will learn that transportation is the way we get from one place to another. We will talk about all the different forms of transportation and whether they travel on land, air, or on water. 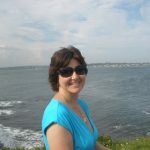 We will discuss the forms they have they have gotten to use and will will learn about traffic signs and safety when walking, crossing the street, or riding in a vehicle. Hopefully, we will even get to visit the local firehouse and go on a firetruck! December was an eventful month! 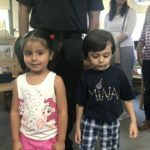 This month Pre-K learned about the community in which they live, Queens, New York. 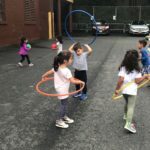 They learned that their school is in the neighborhood of Ridgewood and that some students live in houses while other live in apartment buildings. We took a neighborhood walk and took notice of all the different types of homes and stores we found. We even got to visit a bakery! This month Pre-K also got to participate in the NDCA Christmas Show where they sang Jingle Bells and We Wish You a Merry Christmas while their families watched the show! We also got to watch the Shadow Box Theater perform a holiday show for them in the gym! 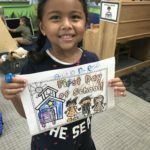 It has been a great month for Pre-K! This month Pre-K will working on their All About Me Unit. They will explore all that makes them unique, from the way they look, to the things they like, to the kinds of families they have, and the traditions they celebrate. 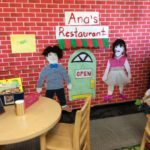 As a Family Engagement Project, Pre-K created likenesses of themselves. They are all so unique! Thank you for all of your hard work and creativity. We will also have a class Thanksgiving celebration in which we share both traditional and ethnic dishes that our parents wish to share. I hope that the students will come out appreciating what special people they are and appreciate all of our differences! For the next four weeks Pre-k will be learning about their five senses. They will be concentrating on each of the five senses separately and learning how their senses can also keep them safe. Autumn is the perfect time for this unit since so much begins to change in nature. Please support their learning at home by noticing how the leaves are changing, how the fallen leaves sound under their feet, how the wind sounds through the trees and maybe notice the taste or smell of some baking cookies or pumpkin pie! 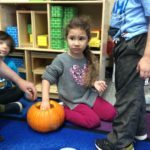 In class we will be making sensory collages, exploring the inside of a pumpkin, identifying mystery objects with our sense of touch, discovering salty, sweet and sour tastes, smelling herbs and spices and so much more! Our dramatic play area will be transformed into a restaurant. This is my favorite Pre-k unit! I hope it will be theirs too! Throughout this month, Pre-K students learn what it means to be in Pre-K. 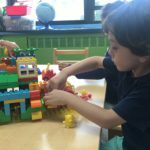 They become acquainted with the procedures and routines of the classroom, learn about the people in our school, and learn how to make friends, share, and clean up their centers. We will also be talking about emotions and how to deal with them. Many students may be coming to school for the first time, or it is their first time attending full day class. This may come with many mixed emotions. We will talk about how it is okay to be scared, nervous or worried and how to deal with those feelings. It is our hope that in no time, your child will be adjusted, comfortable, and ready for a great year!